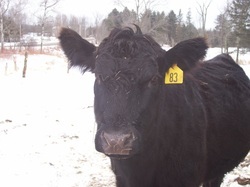 ​We own a herd of brood cows that provides us with calves that we either raise for herd replacements or raise to provide our customers and ourselves with beef. These cows raise their calves until they start getting ready to have their next calf. 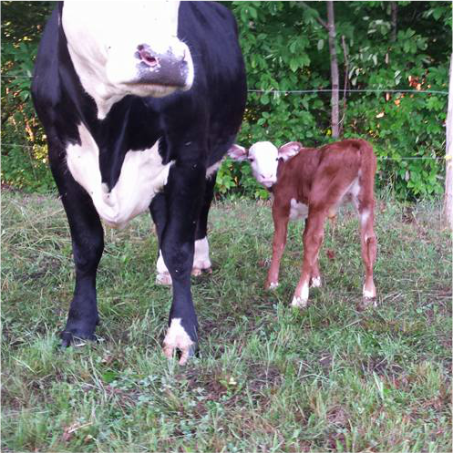 We breed our herd the "old fashioned" way using natural service (a bull right on-farm) so that they have a calf each year. We select our animals for their calm personalities, which makes them easy to work with; as well as for efficiency and production traits. They are great mothers who provide us with fine calves while spending their days grazing or eating hay and napping in the sun. Our cows are on our pasture as early as possible in the spring until late fall. We use semi-intensive rotational grazing to keep the feed plentiful and cows happy. In the winter, they are fed mixed grass hay that we grow and harvest on our farm. We fertilize our hayfields with manure, biosolids, and lime rather than chemical fertilizers. Our beef is processed and cut at a local, inspected facility. The USDA no longer regulates the use of the term "grass fed", but in our definition, grass fed refers to an animal who has eaten nothing but forages, minerals, and mother's milk throughout its lifetime. Forages include species like annual and perennial grasses (timothy, kentucky bluegrass, annual ryegrass, etc. ), forbs (legumes like alfalfa and clover, as well as brassicas like mustard), browse, and grain plants in the "pre-head" stage (when they are still grass like and the grain itself has not developed). In our case, our animals are on pasture when it is available (in Maine, that is generally May-November) In the winter they are maintained on dry hay. They are provided with a mineral supplement to make sure they are in dietary balance. "Grass-finished" means an animal spent the last few months of its life eating only pasture, but may have been fed other feed products before that. 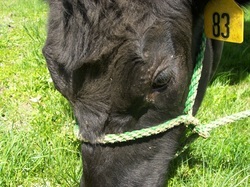 Our animals are generally 100% grass fed, and if they are not, we make this clear when selling! There are many reasons to consider purchasing and consuming grass fed beef, especially when one compares it to conventionally grown beef. In most cases, beef cattle are fed grain because it makes them grow fast, and does so economically. A little grain is OK, but when cattle and other ruminants (goats, sheep, deer, etc) are fed grain on a regular basis, they can develop a disease called acidosis (1). Acidosis occurs because the bacteria in the rumen that help the animal digest their food have to work to ferment the carbohydrates in the grain. These bacteria are slightly different than the ones that work to digest cellulose based plant products. When these specialized gut bacteria work too rapidly, they acidify the rumen, dropping the pH, and increasing their numbers (1). This drop in pH can cause a host of issues, including a decrease in the number of viable rumen bugs (particularly those responsible for digesting forages), liver abscesses, and a sloughing of the rumen lining (1). Many scientists believe that most feedlot cattle would be dead by the age of two were they not slaughtered first, due to acidosis caused by the high volume of grain they are fed (2). Cattle were "designed" to eat grasses (2), and we believe they live better lives when doing so. Cattle are much healthier when they live and feed on pasture. Cows on pasture have better feet and legs and less lameness than cattle that live on cement (3). They tend to live longer (3), and there is less calfhood mortality (4). The animals are generally cleaner, as they are not laying in areas where manure becomes concentrated such as confinement buildings or feedlots (4). Cattle are not the only ones who benefit from pasture based production. Consumers who eat beef from grass-fed animals benefit as well. Grass fed beef is lower in total fat than conventional beef, and is higher in "healthy fats" (5). These include omega-3's, which are thought to help improve and maintain brain function. They also support heart function and help the human body absorb nutrients. Grass fed beef is higher in vitamin B12, E, A than conventional beef (6). Grass based production is much better for the environment than conventional beef. Pastures act as a carbon sink, meaning that they absorb CO2 from the atmosphere and sequester it in plant tissues (7). This is especially important in an era where we are very concerned about greenhouse gasses. Grasses prevent erosion due to their strong root systems. They hold the soil in place and keep it from being removed. The plants absorb and hold rainwater, rather than allowing it to run off like cement surfaces would (8). Since the animals are self-fertilizing the pasture with their manure, 75% of the plant nutrients remain in place (9), keeping the soil healthy and keeping us from having to use artificial fertilizers. 1. Bagley, Dr. Clell V., DVM. "Acute and Subacute Rumen Acidosis". Utah State University. 2. Ruechel, Julius. Grass-Fed Cattle. Storey Publishing, North Adams, MA. 2006. Print. 3. Onyiro, O.M. and S. Brotherstone. Genetic analysis of locomotion and associated confirmation traits of Holstein-Fresian dairy cows managed in different housing systems. Journal of Dairy Science, Vol. 91 pgs.322-328. 2008. 4. Tikofsky, Linda M., DVM. "Pasture and Animal Health". Cornell University. 5. Clancy, Kate. "Greener Pastures: How Grass Fed Beef and Milk Contribute to Healthy Eating". Union of Concerned Scientists. 2006. 6. Abbott, A, et al. Enhanced nutrient content of grass fed beef: justification for health benefit label claim. University of California. 7. Gurian-Sherman. "Raising the Steaks: Global Warming and Pasture Based Beef Production in the United States". Union of Concerned Scientists. 2011. Conservation Service. 7 May 2004. Accessed 16 Feb 2011. 9.Rinehart, Lee. "Organic and Grass-Finished Beef Cattle Production". National SUstainable Agriculture Information Service. 2011. Q: Why is the fat on grass fed beef yellow-ish instead of pure white? A: Grass fed beef has yellowish fat due to the amount of beta carotene (vitamin A) it contains (its why carrots are orange!). There is a lot of beta carotene in grasses and other plants that the animals eat. Q: Why is grass fed beef a little more expensive than conventional beef? A: Just like with anything else, when you buy food, you get what you pay for. Grass fed production requires land area and takes a little longer than conventional practices to result in a quality product. Don't compromise on meat quality, health, and taste! Q: Does grass fed beef taste differently than conventional beef? A: Yes, it does. However, most people agree that the taste of grass fed meat is superb and much more flavorful than conventional beef. Many describe it as a more full-bodied flavor. Q: Is the slaughtering process humane? *If you have more questions about grass fed beef or our production practices, please feel free to email us, message us on Facebook, call us, or come talk to us at the farm!